FLINT, Michigan—Sure, this week is special when it comes to shopping — but Flint’s entrepreneurial spirit is Ebonie Gipson’s business all 365 days a year. Gipson, 35, launched I’m Building Something Consulting in 2016 with a mission to build up and build out Flint’s small business potential. In two years, the company has worked with 300 local businesses. Gipson facilitates workshops that focus on business branding, growth, and customer engagement for small businesses and entrepreneurs throughout the year — but Saturday is one of the biggest events of the year. I’m Building Something Consulting hosted its second Flint Small Business Saturday expo from noon to 5 p.m., Nov. 24, 2018, at Word of Life Church, 460 W. Atherton Road. The massive event will showcase 75 Flint-area businesses and startups. The bulk of the vendors feature locally made, handcrafted products — but these entrepreneurs don’t have traditional brick and mortar storefronts to sell their goods. Most focus their business on online sales, so the expo is a once-a-year opportunity to highlight them to their neighbors. All this comes naturally to Gipson, the third generation of women entrepreneurs in her family. Born, raised and still living on Flint’s northside, Gipson graduated from Flint Northern High School. Professionally she worked for big brands and retailers — such as Coach, Jones Apparel Group, and Ann Taylor Loft — as a store manager, but she continued to see a need to for local investment. Through I’m Building Something Consulting, she has reapplied those skills as a training and retail development manager to help cultivate local entrepreneurs — including La’Asia Johnson, who began working with I’m Building Something Consulting six months ago. Johnson owns Elle Jae Essentials, an Etsy shop that specializes in natural skincare for women of color. From whipped shea butter to coffee face scrubs, she does it all — but being a lone entrepreneur has its challenges and Gipson has been a key support. Johnson recalls telling Gipson in a consulting session that she was feeling less than confident in her product photography. Gipson worked side-by-side with Johnson, spending nearly two hours on product photography. Those remain some the best promotional photographs she has ever taken, said Johnson. Gipson also works with clients in Livingston County, Saginaw, Detroit, and Louisiana. Next year, she plans to take her training program to major cities including Dallas, Atlanta, Nashville, and New Orleans. No matter where she goes though, Gipson continues to advocate for growth of the potential she sees in Flint. 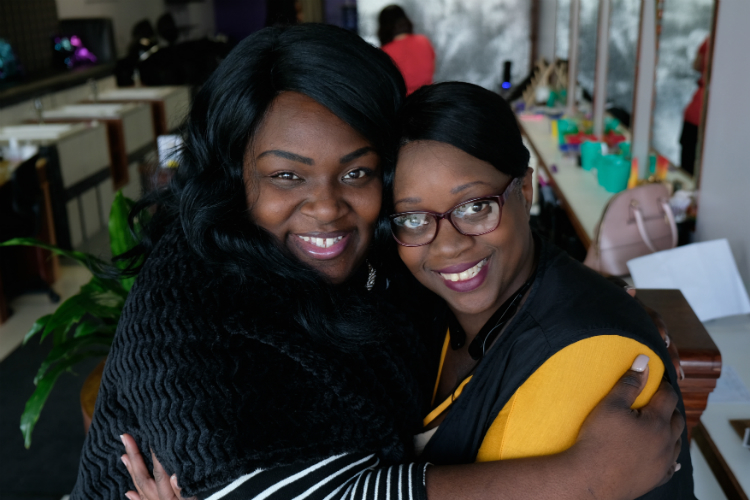 Ebonie Gipson (left) began working with Theresa Nelson, owner of Sweet Tee's Salon and Kids' Spa, three months ago. Nelson is a major sponsor for Small Business Saturday.